● ● ● ● ● ● ● ● ● 88 • FOODSERVICE EQUIPMENT & SUPPLIES • FEBRUARY 2019 residents feel like they aren't stuck in their rooms and can feel as comfortable as possible in this home," Koprivich says. 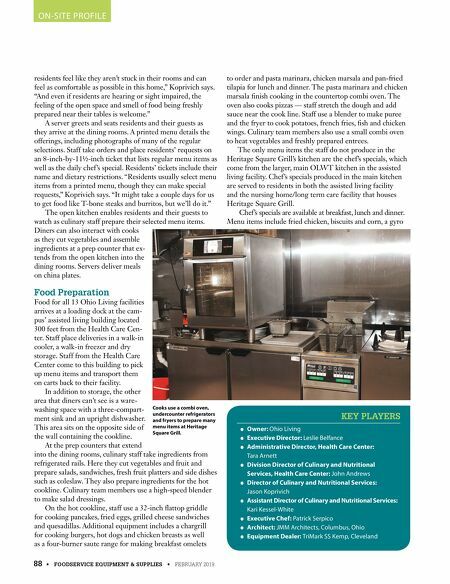 "And even if residents are hearing or sight impaired, the feeling of the open space and smell of food being freshly prepared near their tables is welcome." A server greets and seats residents and their guests as they arrive at the dining rooms. A printed menu details the offerings, including photographs of many of the regular selections. Staff take orders and place residents' requests on an 8-inch-by-11½-inch ticket that lists regular menu items as well as the daily chef's special. Residents' tickets include their name and dietary restrictions. "Residents usually select menu items from a printed menu, though they can make special requests," Koprivich says. "It might take a couple days for us to get food like T-bone steaks and burritos, but we'll do it." The open kitchen enables residents and their guests to watch as culinary staff prepare their selected menu items. Diners can also interact with cooks as they cut vegetables and assemble ingredients at a prep counter that ex- tends from the open kitchen into the dining rooms. Servers deliver meals on china plates. Food Preparation Food for all 13 Ohio Living facilities arrives at a loading dock at the cam- pus' assisted living building located 300 feet from the Health Care Cen- ter. 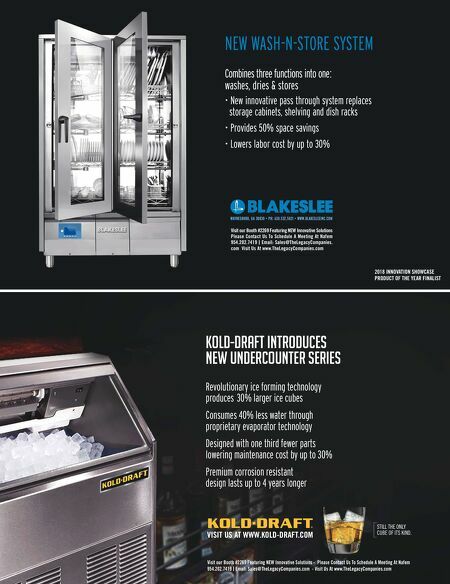 Staff place deliveries in a walk-in cooler, a walk-in freezer and dry storage. Staff from the Health Care Center come to this building to pick up menu items and transport them on carts back to their facility. In addition to storage, the other area that diners can't see is a ware- washing space with a three-compart- ment sink and an upright dishwasher. This area sits on the opposite side of the wall containing the cookline. At the prep counters that extend into the dining rooms, culinary staff take ingredients from refrigerated rails. Here they cut vegetables and fruit and prepare salads, sandwiches, fresh fruit platters and side dishes such as coleslaw. They also prepare ingredients for the hot cookline. Culinary team members use a high-speed blender to make salad dressings. On the hot cookline, staff use a 32-inch flattop griddle for cooking pancakes, fried eggs, grilled cheese sandwiches and quesadillas. Additional equipment includes a chargrill for cooking burgers, hot dogs and chicken breasts as well as a four-burner saute range for making breakfast omelets to order and pasta marinara, chicken marsala and pan-fried tilapia for lunch and dinner. The pasta marinara and chicken marsala finish cooking in the countertop combi oven. The oven also cooks pizzas — staff stretch the dough and add sauce near the cook line. Staff use a blender to make puree and the fryer to cook potatoes, french fries, fish and chicken wings. Culinary team members also use a small combi oven to heat vegetables and freshly prepared entrees. The only menu items the staff do not produce in the Heritage Square Grill's kitchen are the chef's specials, which come from the larger, main OLWT kitchen in the assisted living facility. Chef's specials produced in the main kitchen are served to residents in both the assisted living facility and the nursing home/long term care facility that houses Heritage Square Grill. Chef's specials are available at breakfast, lunch and dinner. Menu items include fried chicken, biscuits and corn, a gyro ● Owner: Ohio Living ● Executive Director: Leslie Belfance ● Administrative Director, Health Care Center: Tara Arnett ● Division Director of Culinary and Nutritional Services, Health Care Center: John Andrews ● Director of Culinary and Nutritional Services: Jason Koprivich ● Assistant Director of Culinary and Nutritional Services: Kari Kessel-White ● Executive Chef: Patrick Serpico ● Architect: JMM Architects, Columbus, Ohio ● Equipment Dealer: TriMark SS Kemp, Cleveland KEY PLAYERS ON-SITE PROFILE Cooks use a combi oven, undercounter refrigerators and fryers to prepare many menu items at Heritage Square Grill.